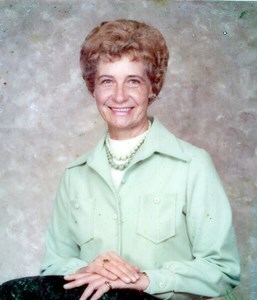 Newcomer Family Obituaries - Gladys Marie Ogden (Sharp) 1922 - 2019 - Newcomer Cremations, Funerals & Receptions. Gladys Marie (Sharp) Ogden, age 96 peacefully passed away April 12, 2019 surrounded by family after a long struggle with Alzheimer’s. Proceeded in death by her husband, Hubert D. Ogden; mother, Hazel (Gilmore) Sharp; father, Lafayette Sharp; brothers, Earl Sharp and William Sharp; sisters, Winifred (Sharp) Bailey and Jewel (Sharp) Wafford; half-brothers, James Whitt and Robert Whitt. Gladys is survived by her son, Lanny (Sandra) Ogden of Kettering, OH; daughter, Patricia (Doug) Stockman of Huber Heights, OH; grandchildren, Angela Moore, Cheryl Web and Melissa Stein; great-grandchildren, Samantha Stein, Steven Stein, Jordan Webb, Dalton Webb and Brenton Ogden; and great-great-grandchild, Noah Ogden. Gladys was a caregiver all her life clear till the end, always thinking of others. The family would like to thank the staff of Walnut Creek and the Hospice of Dayton for their great care of Gladys in her last days. In lieu of flowers, donations to the Hospice of Dayton in Gladys Ogden’s name would be greatly appreciated. The family will receive friends on Wednesday, April 17, 2019 from 11 am- 12 pm at Newcomer South Chapel, 3940 Kettering Blvd, Kettering, OH 45439. The service will follow at 12 pm. Gladys will be laid to rest at Miami Valley Memory Gardens, Centerville, OH. To share your memories of Gladys or leave a special condolence message for her family, please click Share Memories. Add your memories to the guest book of Gladys Ogden (Sharp). I will remember Aunt Pat's smile. She was always so supportive of me. I'm glad she's with her family now in heaven. She struggled, like her brother, my Dad (William) did, with Alzheimer's. Thankfully she's not suffering anymore. (((((HUGS))))) and prayers for each one of you. My the Lord comfort you in the days to come. If we can do anything for you let us know. Missy, we are thinking of you and praying for you all during this hard time. We are so sorry. May she be finally resting in peace. Love from Karen, Terry, Ashley, Judy, and Alex & Abbi.